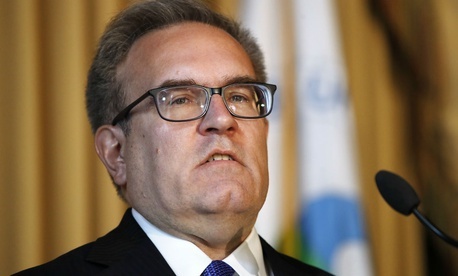 President Trump announced Friday that he would nominate acting Environmental Protection Agency Administrator Andrew Wheeler to be the agency’s leader on a permanent basis. Trump made the announcement at the start of a ceremony to award seven people with the Presidential Medal of Freedom when recognizing agency leaders in attendance. Wheeler was named acting EPA administrator in July, following the resignation of Scott Pruitt, who left the administration amid a number of ethics scandals. Wheeler initially had been nominated to be deputy EPA administrator, and was confirmed in April by a vote of 53-45. He served at EPA more than two decades ago, before becoming an adviser to Sen. James Inhofe, R-Okla. In recent years, he was a lobbyist at Faegre Baker Daniels, and among his clients was the coal mining company Murray Energy. According to the 1998 Federal Vacancies Reform Act, when Trump formally submits Wheeler’s nomination as EPA administrator to the Senate for consideration, Wheeler will be forced to step down from his job as acting administrator. At that point, Trump could nominate another person confirmed by the Senate to be acting administrator. The law also allows the president to name another “senior officer” at an agency to serve temporarily, provided they are at least a GS-15 level and have worked at least 90 days at the agency prior to the resignation. But that provision has come under constitutional scrutiny in recent days after Trump cited it in his decision to appoint Matt Whitaker, who has not been Senate confirmed, to be acting attorney general.